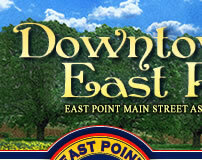 Produced in partnership with the Department of Economic Development, the downtown newsletter incorporates many valuable pieces of information for residents and visitors alike while acting as a resource for businesses. Features include: Business of the Month Article, Community & Business Editorials, Downtown Events Calendar, Welcome to New Businesses, Available Properties, and much more! In addition, there are several areas for businesses to advertise their products/services. The newsletter is available via email, online and in various businesses downtown. Newsletter presented in PDF format. For more information about submitting an editorial about Downtown (memorable experiences, interesting facts or photos, food review, etc. 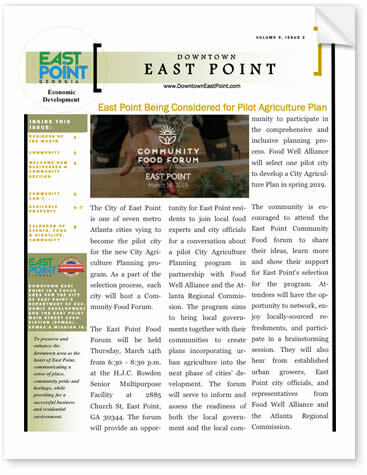 ), purchasing advertising space, or to be added to the FREE email subscription list, send an email to: erodgers@eastpointcity.org or call 404-270-7059.